UpTown Flutes, a dynamic professional flute ensemble-in-residence at Drew University in Madison, NJ presents original works and arrangements composed for the entire family of flutes: piccolo, C flute, alto and bass flutes. UpTown Flutes actively commissions and is dedicated to bringing new music to a wider audience. The group's innovative programming features varying ensemble sizes, genres, styles, and historical periods as well as collaboration with other instruments such as harp and percussion. 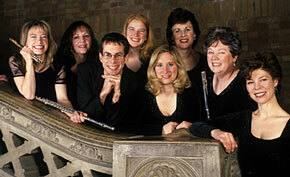 UpTown Flutes' debut CD, "A Flute Renaissance," reflects the group's wide spectrum of repertoire.